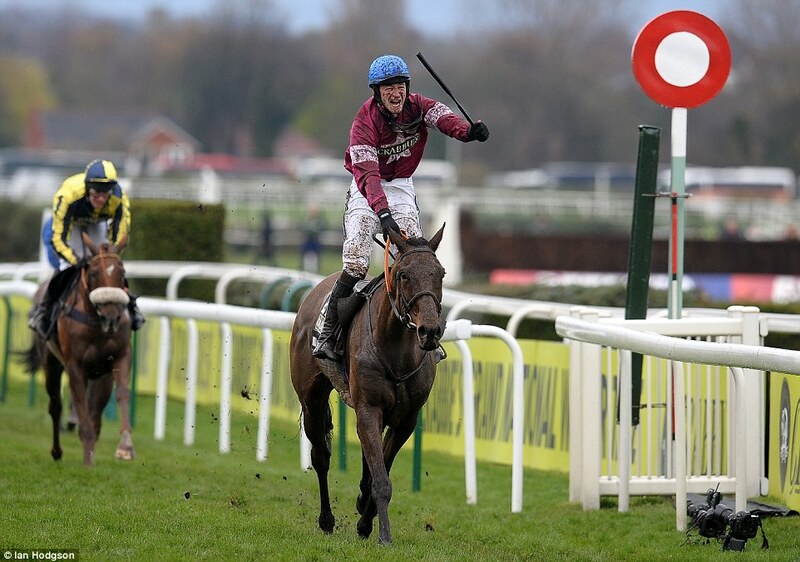 Long shot Rule The World surged to the lead and won the Grand National. Rule the World, a 33-1 long shot that had never won over fences, broke his maiden today at the 2016 Grand National at Aintree . . . ridden by 19-year old David Mullins on his first time around the course. What a story! Can you imagine a horse breaking his maiden at Aintree? And don’t worry, it’s safe to watch the race. All 39 starters (and jockeys) came back safely; 1 completed the race. There were also a couple of game horses that ran (and jumped) at the head of the field. Thankfully, they jumped clean and stayed out of the way of the rest of the field. (There is a slightly better quality video of the race at this link). 19 Year old David Mullins smiles through the mud. The win almost didn’t happen. They had a significant bobble at the fourth to last fence, but Mullins stayed on and they surged after the last fence to pass favorite The Last Samurai. Conditions for the race were wet. Very wet. Heavy rain and the occasional hail showers left the turf spongy and very tiring — several horses were pulled up by their jockeys because of the hard going. 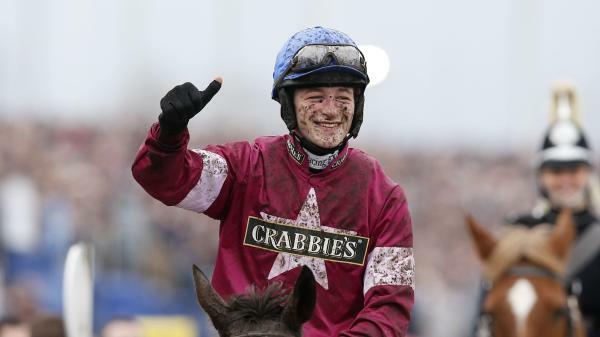 Mullins, who comes from a racing family, is the second youngest jockey to win the Grand National — 17-year-old Bruce Hobbs won back in 1938 — but it’s an amazing achievement for someone who turned pro less than two years ago and who won his first race over fences just a year ago. Mouse Morris, David Mullins, Michael O’Leary and Rule The World. Rule The World is a 9-year old gelding who started his career over hurdles and moved up to Steeplechases in 2014. He finished second in five races before his win today, but also racked up some serious injuries, including fracturing his pelvis twice. Having reached the pinnacle of Steeplechasing success, Rule The World’s owner, Michael O’Leary has indicated the 9 year old gelding will be retired. ‘He isn’t a young horse,’ said O’Leary. ‘He has had multiple injuries and what you would hate to do now is risk him and lose him. 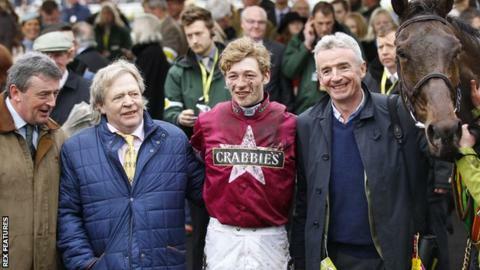 He has won a Grand National — would you want to send him back here next year with 11st 8lbs on his back? I don’t think so. For Morris, who also trained the Irish Grand National winner just twelve days ago, winning the Grand National at Aintree was a personal triumph after a year recovering from a personal tragedy — His 30-year old son Christopher died from carbon monoxide poisoning last year in Argentina.